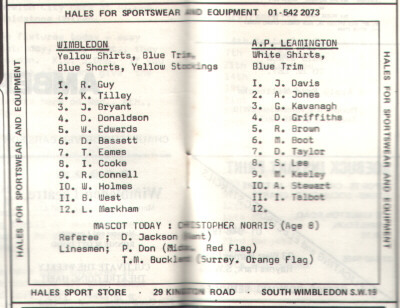 This was a Leamington side's first ever game in the Southern League Premier division. It is also the only time the only season they have crossed swords with Wimbledon in a league situation and visited Plough Lane. 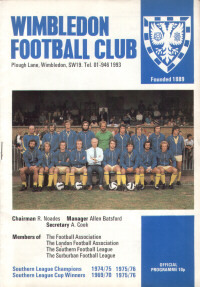 While AP stayed in the division before joining the Alliance Premier forming group of clubs, Wimbledon won the league and continued their now famous rise to the top. Wimbledon had won the Southern League Premier the previous season but were only accepted into the Football League following this campaign. Note APs ex-League players: Micky Boot (Arsenal), Steve Lee (Birmingham City) and Doug Griffiths (Wolves + English Schoolboy international). Wimbledon have a certain D. Basset at number 6.